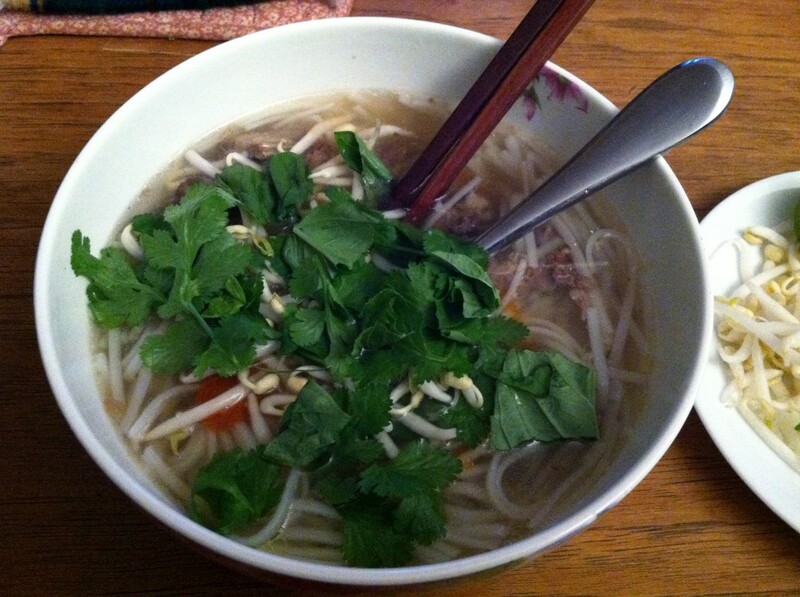 Pho, or Vietnamese noodle soup, has gained much popularity in the U.S. over the last couple of decades. The big cities on the west coast, populated with so many Asian immigrants and with a constant influx of tourists, have turned pho into a hip, cool dish to eat. 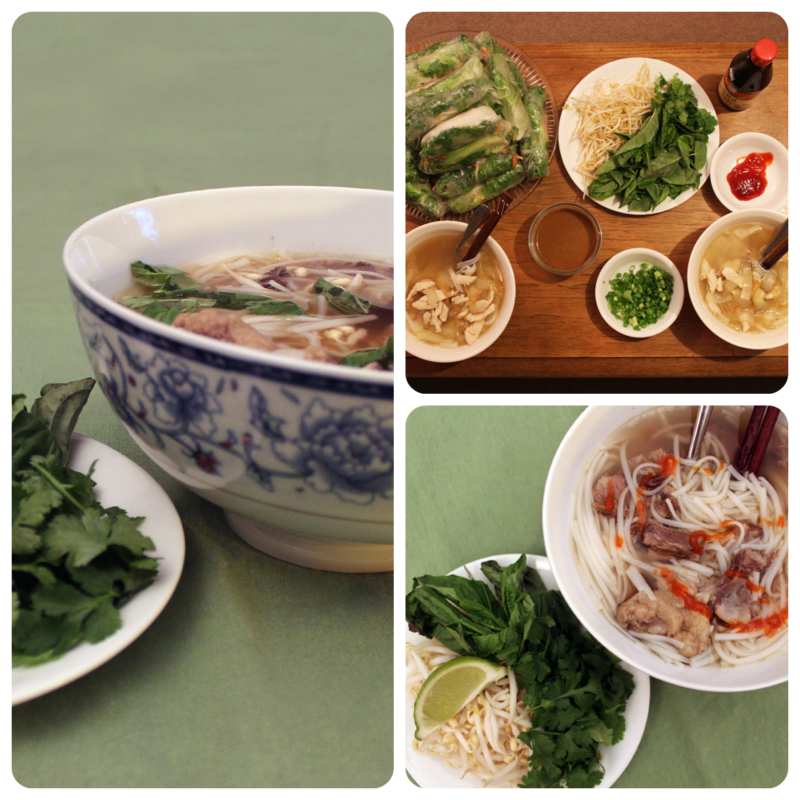 But even though plenty of people like to eat pho, not many people have tried to make it themselves. I have some good news for you: it’s very easy and inexpensive to do! There are tricks, of course, and I’m certainly not the expert. But it’s easy enough to make at home, and makes a ton of leftovers, so why not try your hand at it? As you might know, this past October I made the best oxtail stew ever. 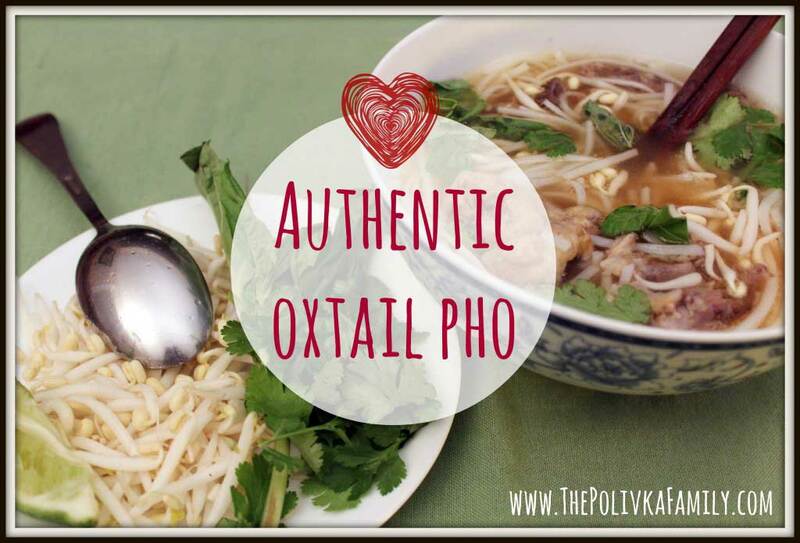 The broth in the stew was so luxurious, so heavenly, I thought, why not make an oxtail pho? 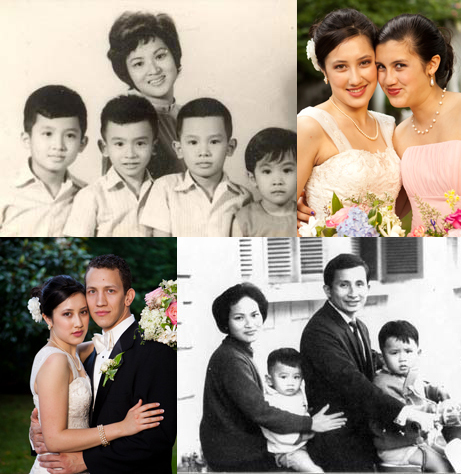 Here are some old pictures of her, and some pictures from my wedding. I have her cheekbones, don’t you think? Now, let’s make oxtail pho! ***Secondly, this takes 10 hours to simmer. You can technically do it in 4 hours, but 10 hours is better. I began this before bed, and it was ready for lunch the next day. You could also just get up really early and have it ready for dinner on the same day. 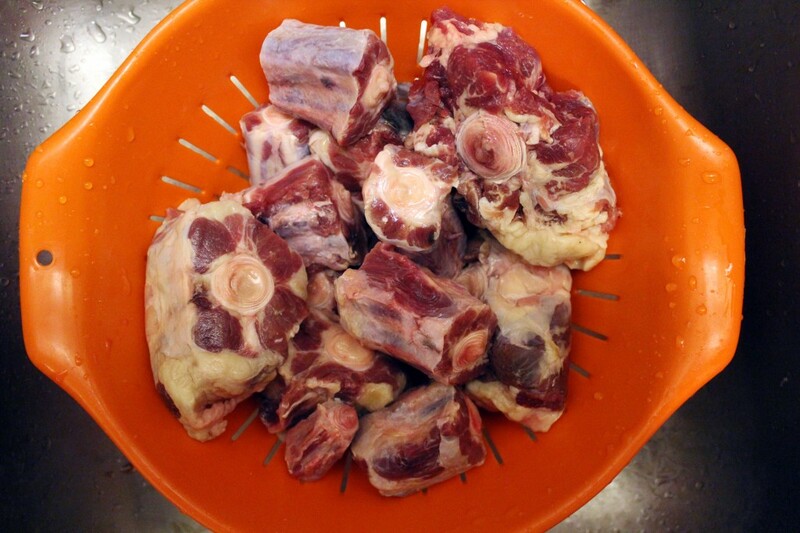 Place the oxtail in a strainer, and rinse under cold water. 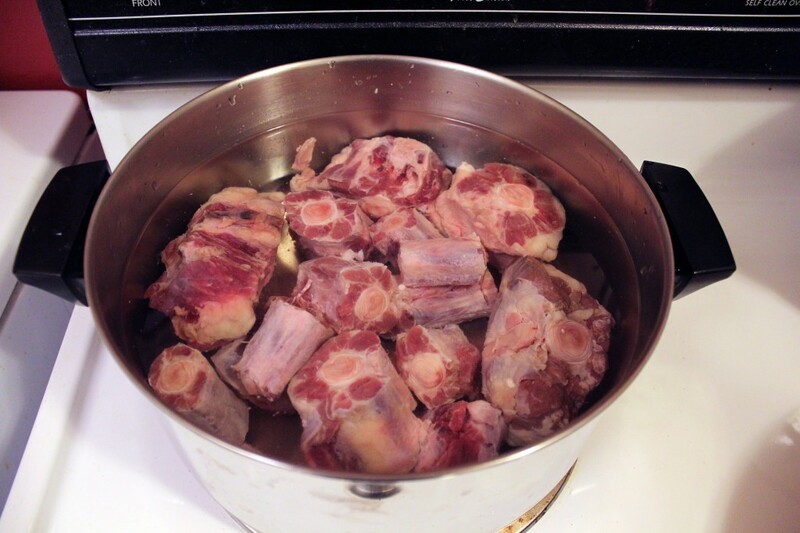 Place the oxtail in a 6 quart pot, fill with cold water, and bring to a boil. While the water warms up to a boil, cut your onion in half and throw away the onion paper. Place the onion face down, along with the ginger in a baking pan. Then place the ban 3 inches away from the top of the onion (or on the highest rack), and broil for 15 minutes. When the water starts to boil, a thick scum will float to the top. Skim this off and throw it away. Pour the oxtail back into the strainer, and rinse again. 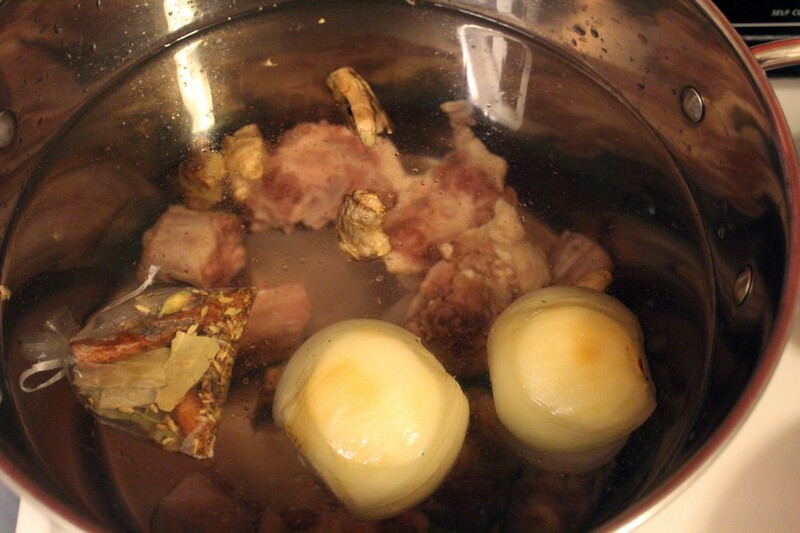 Then place into the large stock pot, and fill the stock pot with clean filtered water. 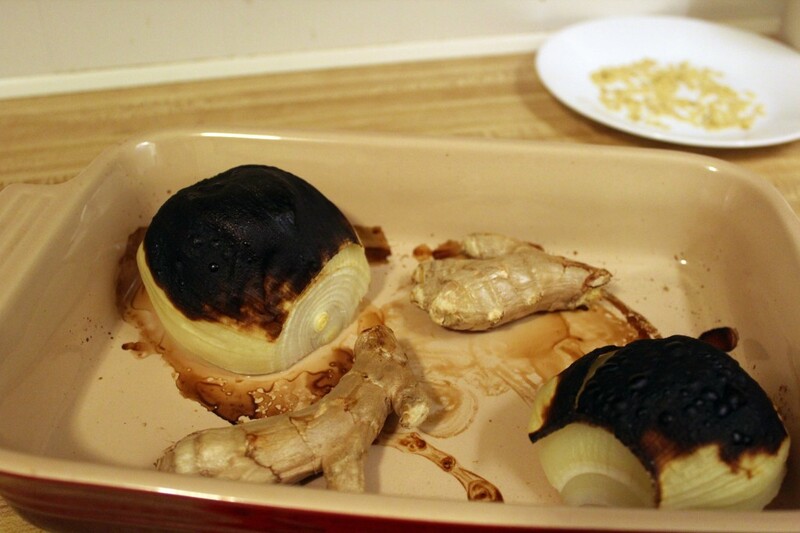 Remove the charred outer layer from the onion, and cut the ginger into a few pieces. Add the onion and ginger to the pot. Toast your spices. 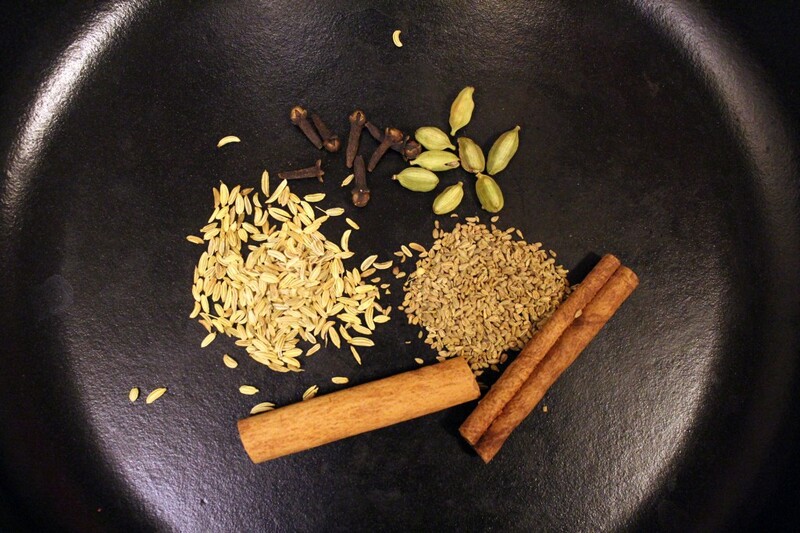 Place the whole cloves, cinnamon sticks, cardamom pods, fennel seeds, star anise or anise seeds, and coriander seeds in a dry skillet, and toast until aromatic. You won’t see the coriander seeds in my picture because I, unfortunately, ran out right before I made this. 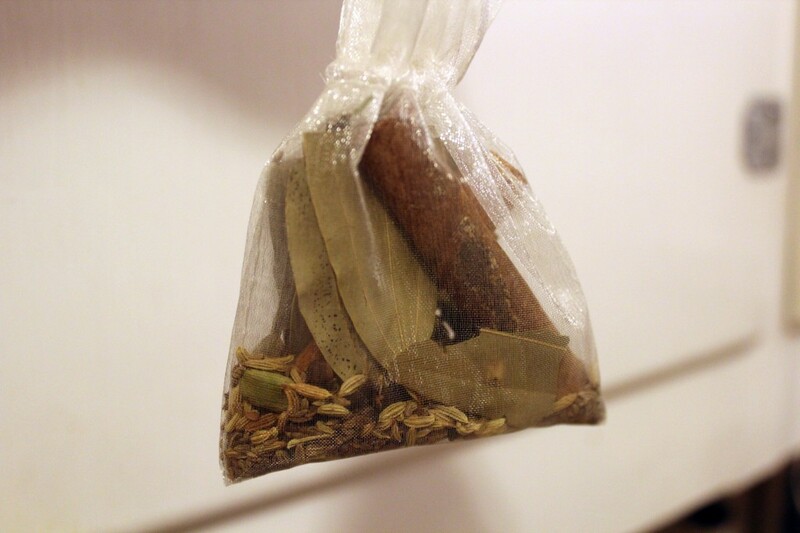 Place the toasted spices, along with the whole peppercorns and cassia/bay leaves into a mesh sachet or tea bag. Make sure it’s tied securely. If you don’t have a tag bag, then use a bit of cloth and tie tightly with kitchen twine. Then, place the bag of spices in the pot. Bring the pot to a boil, cover, reduce heat to a low simmer (on my stove, it was the #2), and simmer for 4-10 hours. Four hours is good. More is better. Make sure the broth continues to simmer after you turn the heat down before you walk away. It doesn’t need to be a steady simmer. A few bubbles and burps, every-so-often, suffices. After 4-10 hours, your broth is done. Now, it’s time to prepare the noodles and garnishes. Bring a 6 quart pot of water to a rolling boil. Add the rice noodles to the boiling water, and remove from heat. Allow to soak according to the directions on the package. I used the Three Ladies Brand (buy here), which take 50-60 minutes to soak, so plan accordingly. 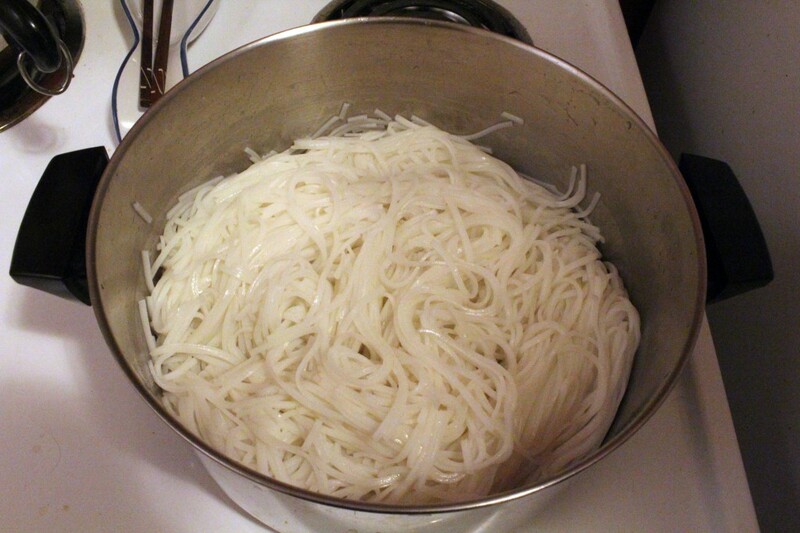 *TIP: Be careful not to oversoak your rice noodles, or they will get mushy and fall apart. Slice your lime wedges, chop your cilantro, slice your jalapeños, plate your bean sprouts, get out your sriracha, etc. Okay, this is when I usually add my fish sauce. You didn’t forget about fish sauce did you? Pho just isn’t pho without fish sauce, because it adds that crucial salty element. I add my fish sauce last because I do it based on taste, not measurement. Frank and I like different amounts of salt in our food, so we add it bowl by bowl. You can add it to the general pot though, if you like. Add it a 1/4 cup at a time, until you reach the right amount of saltiness. You should taste it after each addition. Portion out the rice noodles into bowls. Pour the boiling broth over it, and then add your garnishes and sriracha sauce. Enjoy! Leftovers day 2: Same garnishes, but I added mushrooms to my leftovers, because we ran out of oxtail! Plenty of broth left though. I’m going to freeze it and add thin slices of rare eye round steak next time. The rare steak will cook in the hot broth as it sits. Yum! Hi Courtney I been trying to make this for years. I seen some recipes calling for beef knuckles and Ox tails combined have you tried both? I also hear there a broth pack you can add in it. Have you heard of that? Grateful you posted this. I’m in the phase of cooking pho for my family and then going the next day to my favorite pho spot to analyze why my pho is not nearly as good. I’ve had a couple wins with chicken pho, but my beef pho turns out too dark and beyond savory. I hadn’t been rinsing either which I think throws off the texture. 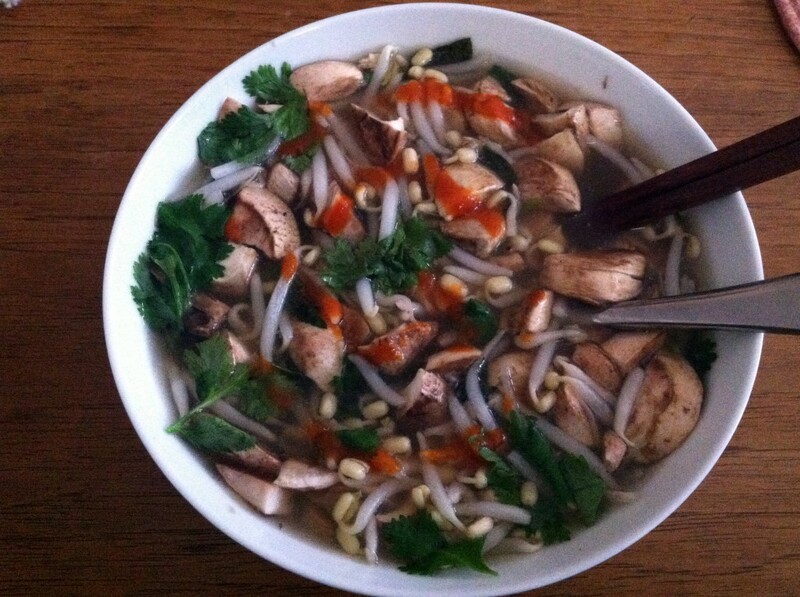 I’m just so impressed when I see golden pho that appears watered down but explodes with flavor. Grateful for what you do and what you’re sharing with the world. May 2015 be full of successes for you and your family.